On February 5th I finally had the pleasure of receiving my SNAP! 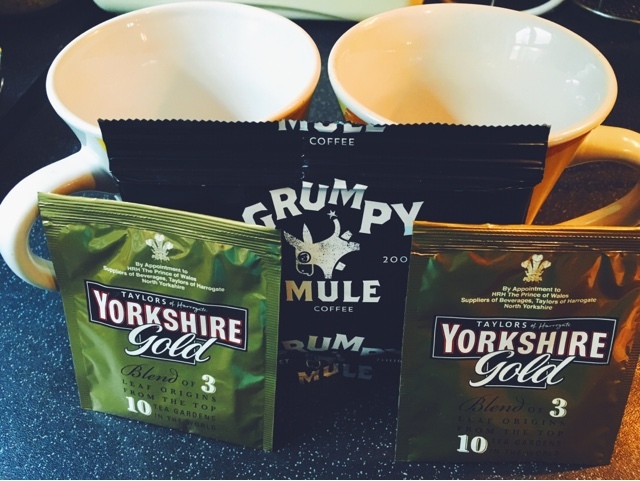 Yorkshire Recipebox. SNAP! are a relatively new (amazing) independent Yorkshire business, who I previously wrote about in this post. The timing of this month’s box couldn’t have been better, considering N & I were in full-on moving house mode (more on that in another post!). Up to the eyeballs with stuff to do, it was such a treat to get home after work on Friday to find everything ready and waiting. 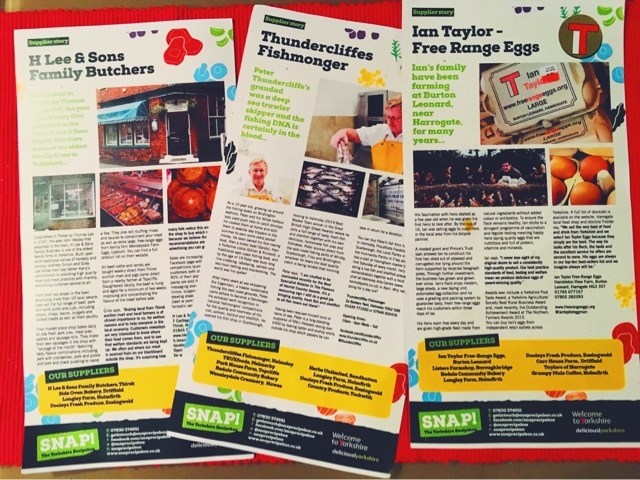 That’s the beauty of it – it’s delivered straight to your door via a courier, so you can keep track of it as it winds its way from the heart of North Yorkshire onto your dining table (or coffee table in our case). I opened up the box and was immediately astounded at how much fresh produce was fit snugly inside! Like a little Mary Poppins box. 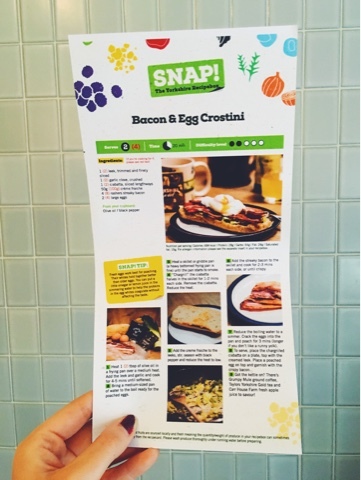 Prior to the delivery date, I’d gone online to SNAP!’s site and picked two of their three evening meal options, along with one of their two brunch meal options. Inside my little treasure trove of goodies lay all the ingredients for the three meals I’d requested, all neatly weighed out. 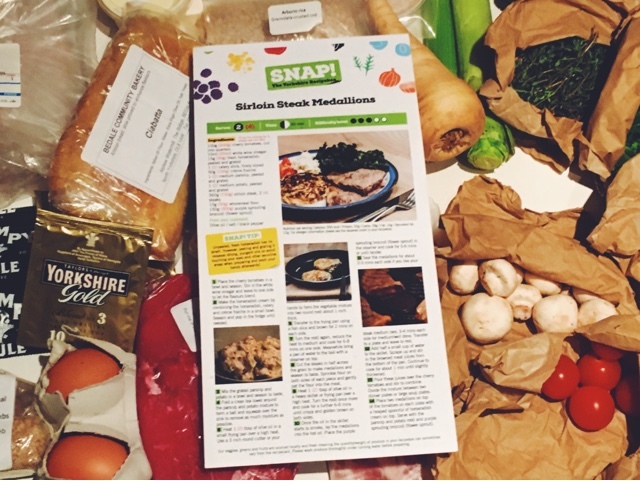 Alongside all the great grub were three recipe cards which listed exactly how to use all of these wonderful bits and bobs. A great thing about SNAP! 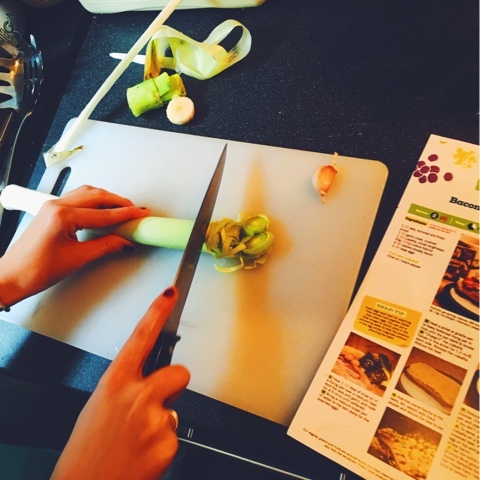 Recipeboxes is that if you wish to feed more than two, you can – it’s adaptable. It just means you have to go purchase some more ingredients, but the cards tell you how much more you’ll need. After gazing gleefully at our plentiful table of food and taking numerous Snapchats of our SNAP! stuffs, we fired up the oven – well, we turned it on – and set to work. 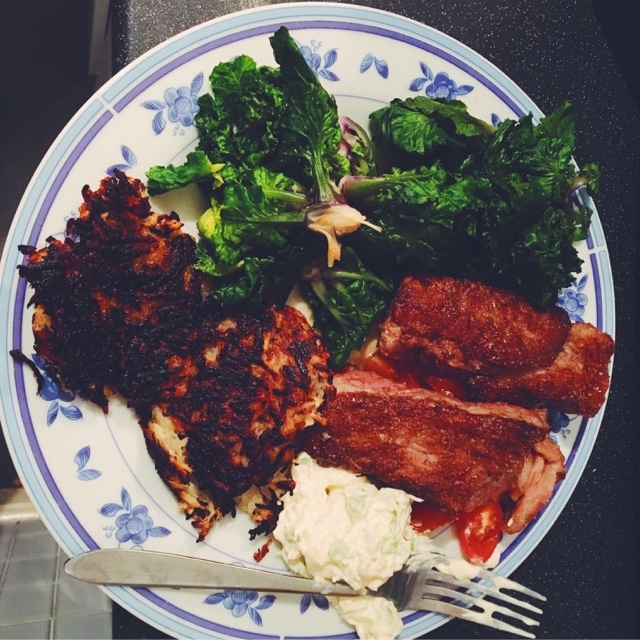 On Friday we opted for the Sirloin Steak Medallions dinner, with horseradish and celery cream, potato and parsnip rosti, and purple sprouting broccoli. 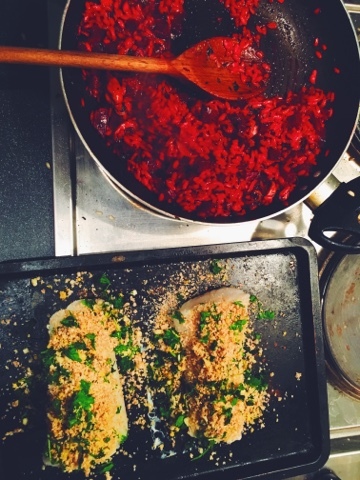 We had so much fun making it, sipping on red wine and laughing as we followed the recipe step-by-step. 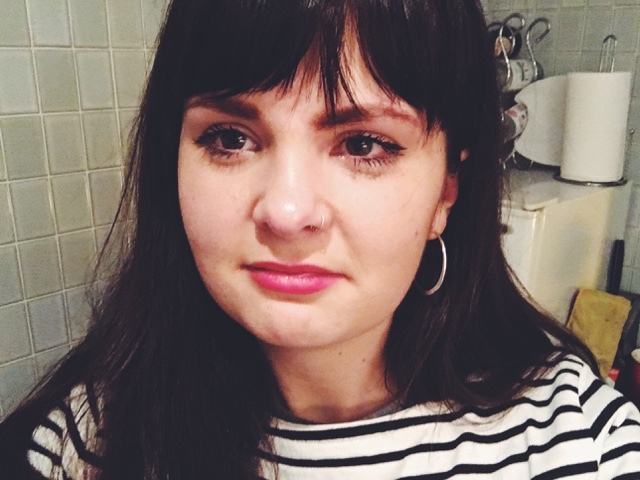 I also wept slightly after grating horseradish. My eyes! They burn! The steaks were supplied by H Lee & Sons Family Butchers in Thirsk. I love that on the back of the recipe cards I can see the history of the homegrown business. The meal was delicious, of restaurant standard. 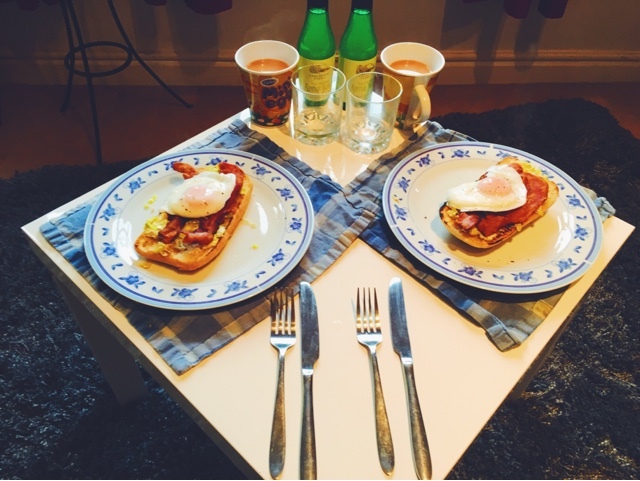 We were innately chuffed that we had managed to concoct something so creative and bloody tasty. Watch out Nigella, I couldn’t help but think. Presentation's maybe not my strong suit. 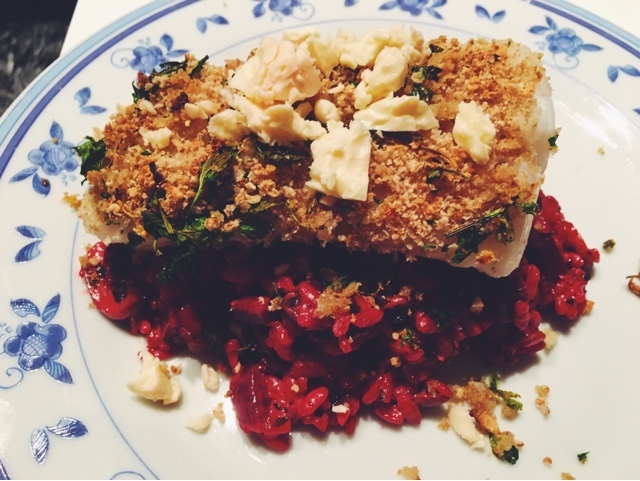 On Saturday night it was time for the Gremolata-Crusted Cod (sourced from Thundercliffes Fishmongers in Helmsley) on a bed of mushroom and beetroot risotto, topped with crumbled Wensleydale Cheese. Another thing I love about SNAP! is how they introduce you to new recipes/ flavour combinations you would never normally try. 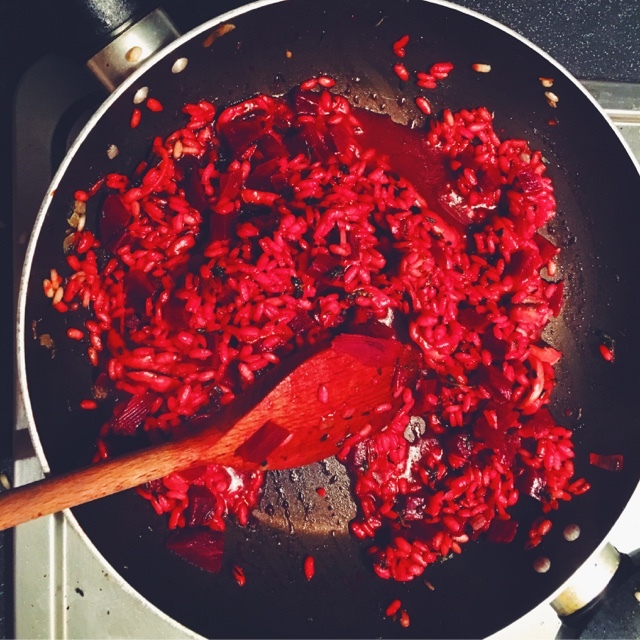 Beetroot risotto, for example. Whodathunk that it would be creamy, colourful, and all round DIVINE? Not me. Consider me converted. The next day with a slight headache from a wine-filled weekend, SNAP!’s Sunday brunch was very much anticipated and appreciated. 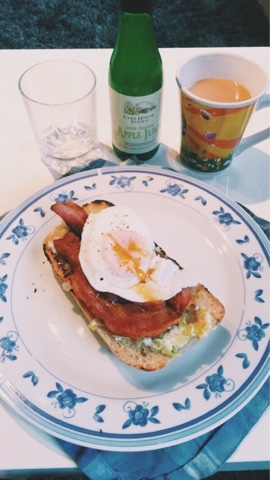 We’d opted for the Bacon & Egg Crostini, complemented by Yorkshire Tea, Grumpy Mule Coffee and Carr House Farm’s farm pressed apple juice. Amazingly, the ciabattas were fresh from Bedale Community Bakery. Bedale, if you don’t know, is where N hails from and where I spent a couple of years living. It’s also where my Mama lives. It’s a cutesy little Yorkshire market town, and also ‘The Gateway to the Dales’ (ooh la la). For the Crostinis we seared the ciabattas in a frying pan, then teamed them with chopped leeks mixed with crème fraiche, a gorgeously fresh free range egg, and the tastiest streaky bacon I have EVER had from Lister’s Farm Shop. I don’t usually care much for bacon, but this was crispy, salty, and just DELICIOUS. Don’t go bacon my heart, gimme some more. Once again, the addition of leeks to our brunch meal was something I never would have thought of, but it worked extremely well. After a weekend of superb grub, we felt revitalised and raring to pack up more of our belongings! The fact that everything was fresh from independent Yorkshire businesses made it all taste that little bit more sweet. 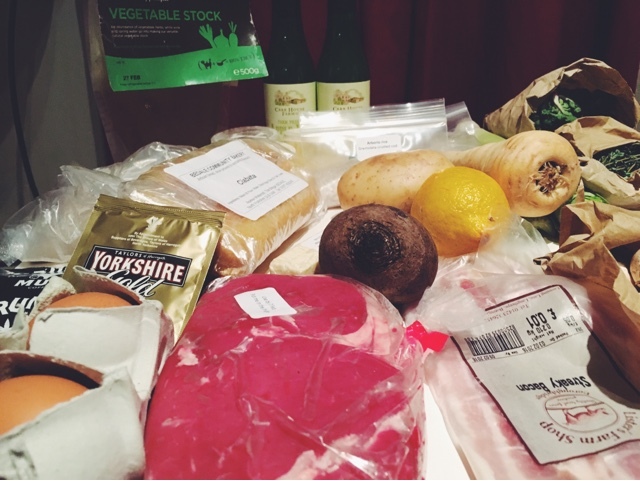 What’s even greater than all of this, is that this glorious recipebox is only £30! Between two, that’s £15 each. That’s how much we’d usually spend on a grubby takeaway. 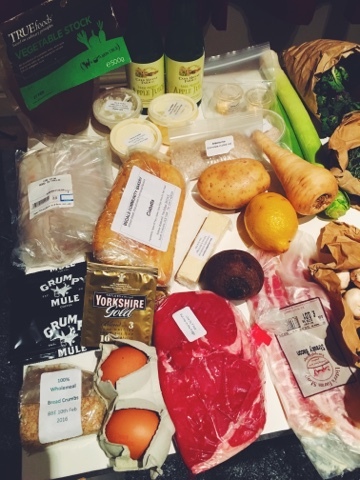 £15 for three weekend meals is unbeatable really, especially when it’s all glorious, fresh Yorkshire grown produce and going into simple, exciting, tasty new recipes. I literally cannot recommend SNAP! Recipeboxes enough! They really help eliminate the stress from the joy of cooking. Their next box will be taking off on 5 March. Sign me up!